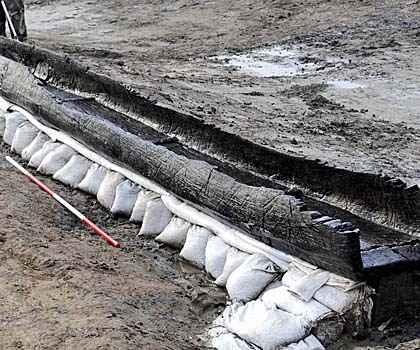 Archeologists from Cambridge Archaeological Unit have unearthed 8 Bronze Age wood boats from a quarry in Britain. The boats are believed to have been carved by people living in the area approximately three thousand years ago and were for unknown reasons buried intentionally. The quarry is approximately 150 miles north of London in an area near Peterborough called Cambridgeshire—its owned and operated by Hanson UK (who is also funding the excavation) and is part of Must Farm, a brick making company. The boats were first found in 2011—since that time, excavators have dug them out of the dry (River Nene) bed and transported them to another archeology site—Flag Fen—for preservation processing. The boats are currently being housed in a cold storage facility to prevent the wood from rotting. Visitors that wish to view the work can peer through windows. The boats were all carved from single tree trunks (six oak, one alder and one lime) and range in size from small single person watercraft to large vessels capable of carrying up to 20 people or a tonne of cargo. Researchers working on the project suspect the boats were all sunk intentionally because the transoms had been removed and were not found at the site. Transoms are flat thin boards that fit into slots at the rear of boats. When in the slots they prevent water from entering the boats—when removed, they allow the boat to fill and sink. 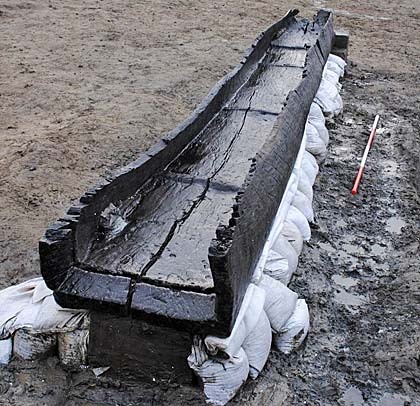 To sink the Bronze Age boats would have required extra effort however, as they were made of nothing but wood. The research team doesn't know why the boats were sunk or why they were never recovered. The area near where the boats were found came to be naturally flooded approximately 4000 years ago, necessitating adaption by the people who lived there. Archeological evidence suggests they learned to carve boats out of tree trunks and used them to move around, to transport goods and animals and of course to catch food. All of the boats have been well preserved and represent the largest number of Bronze Age boats ever found at one location. The archeologists studying them report that all of the boats were heavily used and most show signs of having been repaired. One also sported etched criss-cross patterns inside and out.